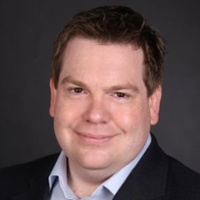 Alistair Lowe-Norris leads the global strategy for Adoption and Change Management at Microsoft. Read the interview below to hear how he has seen change management grow at Microsoft and how he sees change management making a difference. (Want to learn more about change management at Microsoft? Download the success story). The people in Microsoft have been doing change management for a long while, but it hasn’t been very public. The original group that drove change management started in 2005 and was known as the Business Strategy Consulting Team. This team of 25 individuals focused on helping customers who had bought large amounts of technology get the best use that they could out of it. They worked directly with customers and CXOs at the executive level, helping customers adopt new ways of working with the technology that they had purchased. Around 2009 or 2010, Microsoft realized that change management could be a competitive advantage as a strategic capability. This would require a more comprehensive and scalable change management methodology than what we had been using. Microsoft now has a dedicated team of around 100 people who focus all of their time on adoption and change management, helping customers and partners grow their own capabilities in change management and gain real business value from the products and services that they purchase. One of the reasons that we pursued an existing methodology was the standard of excellence that we have set with our customers. We already had our home-grown methodology for change management, which worked very well. However, before we could even have a sensible conversation about the value of change management, we found that our customers were asking in-depth questions about our methodology, the research behind it, and why it was applicable. This obviously slowed our change management work. It made sense to eliminate that problem by moving from our own proprietary approach to change management to an external, globally recognized framework – and we chose Prosci, which we consider the global leader in the professional discipline of change management. We chose Prosci for a number of additional reasons. First, Prosci has a comprehensive set of intellectual property (IP). Second, the Prosci methodology is research-based. Twenty years of experience and research really shines in the IP. Third, Prosci came with a comprehensive set of training and readiness that we could use and customize to grow the capability. Finally, we chose Prosci because of its focus on individual change in addition to organizational change. Some methodologies are purely focused on organizational change, but Prosci has both. The focus on people at the individual level aligns with Microsoft's mission "to empower every person and every organization on the planet to achieve more." A lot has changed particularly in the last three-and-a-half years. Internally, we’ve certified over 2,250 people in the Prosci methodology. We've also delivered formal change management training to managers and employees, covering at least another 1,000. We've touched over 25,000 people with readiness around change management at some level. So today, change management is spread much more broadly across Microsoft than when we started. Our investment in a community of practice and localized change networks has helped us build and support our practitioners. When a change practitioner graduates from the Certification program, they are welcomed into a robust community of practice that includes subject matter experts, monthly meetings, and a network where they can problem-solve and discuss and learn. We also are involved with change management industry associations worldwide – on the board or in individual chapters, sponsoring events and change management knowledge growth around the world. This is one of the values that Microsoft gets from having such a broad community. Because we work with thousands of customers worldwide and we have over the years, we can bring that learning back and we can use it to help Microsoft be better when driving change management projects. You also invested in a robust instructor program to certify many practitioners, correct? Yes. Today Microsoft has more Prosci-Certified Advanced Instructors (PCAIs) than any company in the world. We’re on track to having in excess of 20 PCAIs during the next year. Having PCAIs is huge for our organization. It’s a very, very big step up from Train-the-Trainer graduate to the PCAI designation. A Train-the-Trainer graduate gains the knowledge and tools to teach Prosci’s role-based training programs. But as a PCAI, you have to be good enough to make the material live and breathe with over 70 personalized stories throughout. And your knowledge of the material must be so much deeper. If the power goes out, you must be able to teach the entire three-day certification program from memory – no slides, no material. Just you and a flip chart, which has happened before. We created an instructor development program that would support all PCAI candidates. It includes a mentor and coaching program so that by the time these candidates are ready for their final, official audit from Prosci, Microsoft is confident not only that they will pass, but that they will be a world-class instructor. This is, honestly, what Prosci requires to give someone the title of Prosci-Certified Advanced Instructor. We first published a playbook of the Prosci IP with customized webinars, online training, and a self-serve curriculum that allows people to teach themselves change management. This made it easy to find and use what is most relevant in every situation and role. All of this was packaged up in a living OneNote that updates on an ongoing basis. And we updated our enterprise license with Prosci to support this. Microsoft has access to every piece of Prosci IP. This was crucial for us because we needed to offer our people internally and externally the right IP at the right time. As Prosci releases new IP, the OneNote is updated, and we keep our change management community up-to-date. We are also continually customizing Prosci’s IP to scale and integrate more fully with Microsoft’s internal and external groups. We have created customized webinars and online training that teach the masses about change management and the competitive differentiation change management brings to Microsoft. We’ve also customized formal, in-person training for various audiences from sponsors to managers to champions and project managers, and we’ve accredited these courses with PMI and ACMP. We’re now creating virtual instructor-led training and embedding change management principles into our management course. The management course alone will bring change management to 25,000 managers. We did this in three ways: First, a majority of enterprise customer-facing people inside Microsoft went through training and gained access to tools for talking about change, explaining what it is and why it's important, and for sizing and scoping change projects. Obviously, our consultants can move in where a customer needs Microsoft to engage more heavily. Second, we rolled out adoption and change management content to customer-facing portals. This allows customers and partners to see how to drive adoption and usage inside their organizations using change management principles. It's funny, people always think that training and communication are the ways to solve your change management problem, which they aren’t, as change management requires much more than that. However, we solved the lack of change management in Microsoft by ensuring a strong focus on formal change management training, supported by a strategy and pool of change management professionals and subject matter experts. We got people interested in change management, and now more and more people are asking to get trained. Today, we are embedding change management into Microsoft's lifeblood. That change management creates a competitive advantage for our customers, and it achieves business outcomes and ROI at a greater rate than you would have otherwise seen. 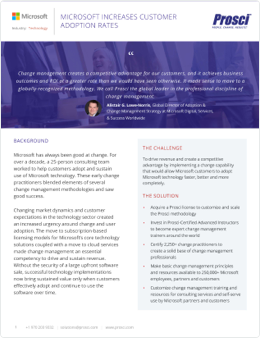 Get the full Microsoft success story – including how the Microsoft change team socialized change management internally and externally. Download the PDF by clicking the link below.